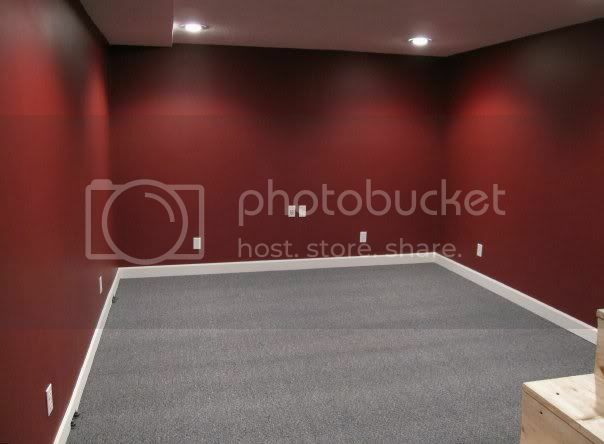 Just wanted to share my experiences from the construction and setup of my small dedicated home theater room. I'm a complete novice when it comes to construction and home theater technology, so I hope this post proves that if I can put together a somewhat decent home theater...anybody can! 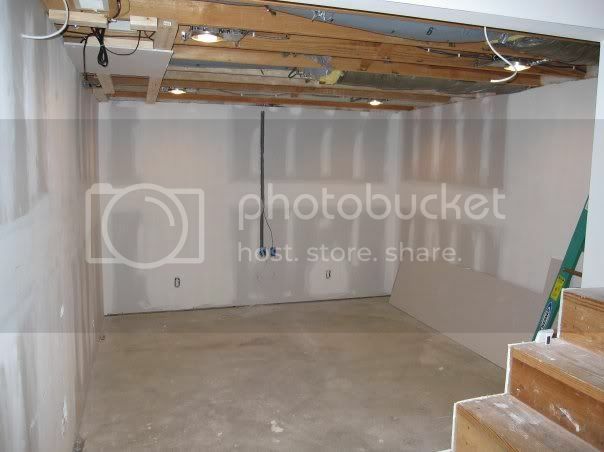 The home theater began as unused room in our unfinished basement. 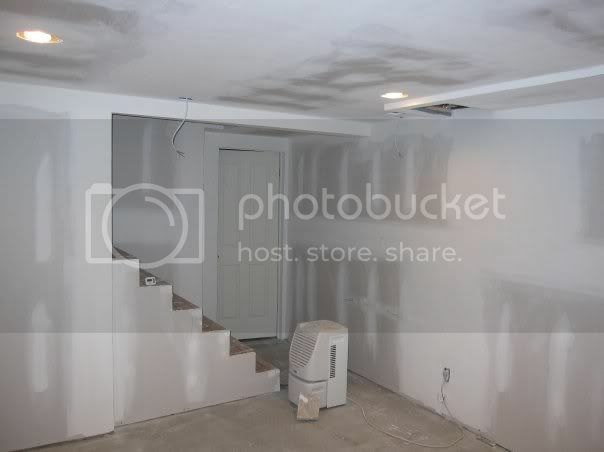 When my wife and I bought our house, the basement was just concrete-brick walls. About two years ago, I framed and insulated the walls and hung drywall so the bedroom above wouldn't be so cold in the winter. Since that time, we have been using the room for extra storage. 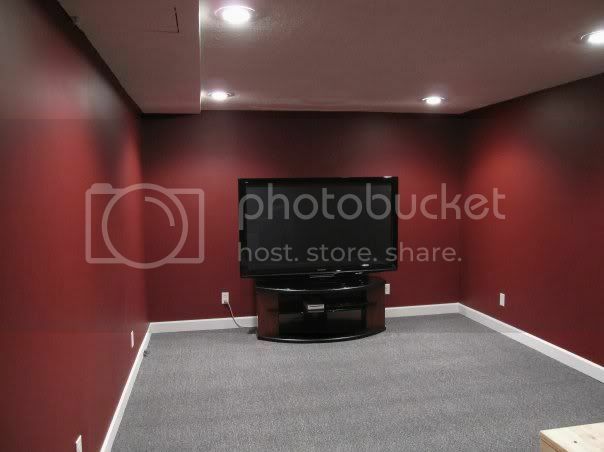 In late July 2009, we decided to turn this partially finished room into a dedicated home theater. You gotta love it when your wife/girlfriend/significant other actually says "I think we need to sell our TV, buy a bigger one, and set up a surround sound system." I think I've got a keeper! 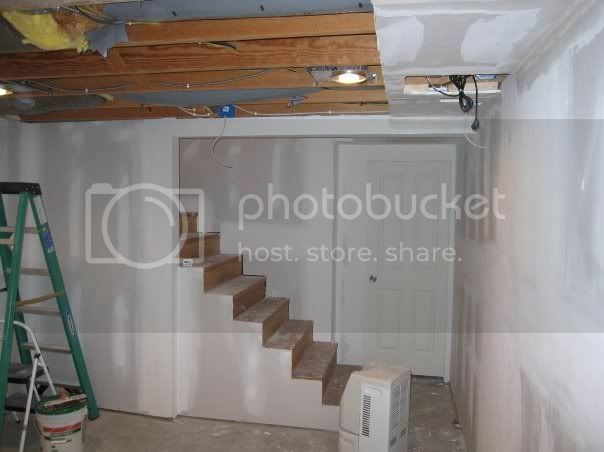 This picture was taken in mid-August when the insulation was being pulled down to make room for speaker wire/ethernet cable installation in the floor joists. The rear speaker wire will run through the ceiling and the far wall. Outlet boxes and a conduit have been installed in the wall to accept the wire/cables. The room through the doorway in the above picture is currently being used for storage as well, but in a few months (early 2010) I'm going to be converting that room into a concession stand/media storage room. Speaker wire and ethernet cable have been installed and the last of the junk has been removed from the room. Insulation has been replaced. 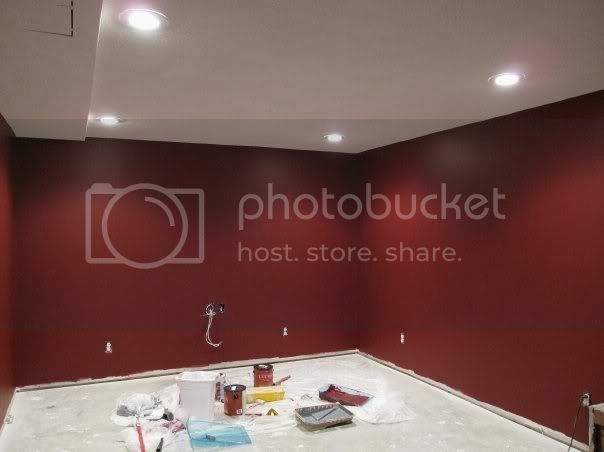 Next, the far wall will be repaired where I installed the conduit and after that the ceiling will be put in. 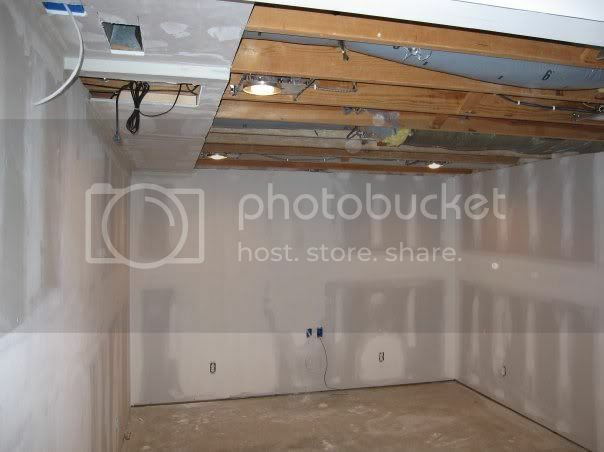 All the drywall has been repaired, now it is time for the ceiling! The ceiling is installed. Thanks to some help from my strong friends, the ceiling went up in no time. 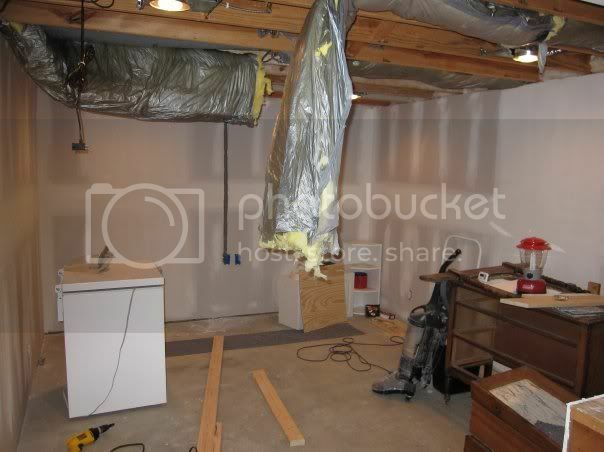 I tell you, a drywall lift is one of man's best inventions! Mudding and sanding the ceiling was hot, dirty, backbreaking work...and this was a tiny space! I can't imagine doing this over an entire house! 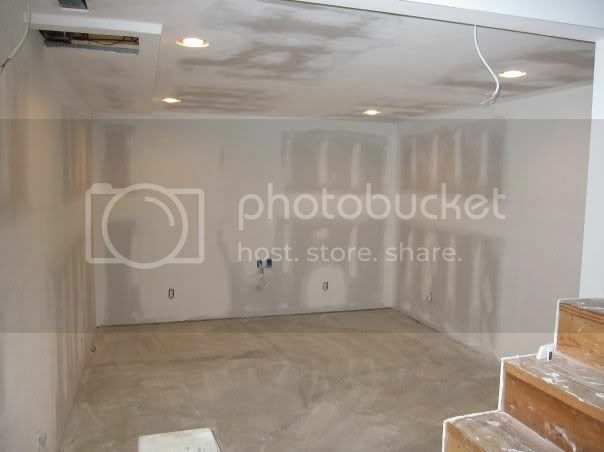 Ceiling has been textured (to help hide my not-so-great mudding job ) and the walls have been primed. Top coat painted, turned out better than I expected it to. I was working really quickly during this period because the TV was going to be delivered in 4 days. Wall plates and outlet covers have been installed, floor has been cleaned and ready for carpet installation. Three days until the TV arrives! Thanks, Rick! Equipment will be located on/near the TV stand...I'll have pictures up very soon. The theater is actually finished, I'm just now getting around to putting up pictures documenting the work. By the way, I love your setup...looks incredibly clean and professional. 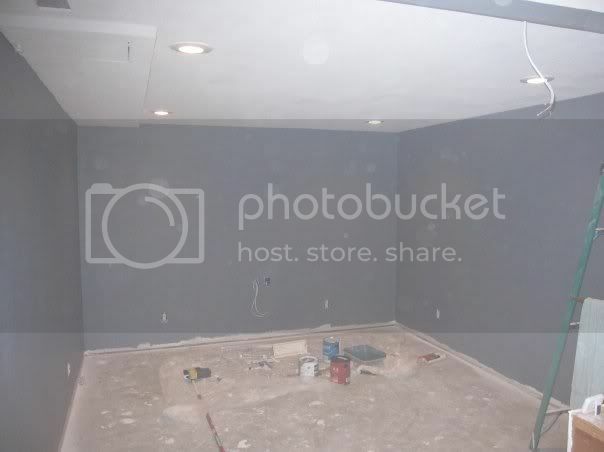 If I would have been planning for this room to become a home theater since the beginning I would have done a lot of things differently (like make a dedicated audio rack in another part of the room). Bravo on a job well done! 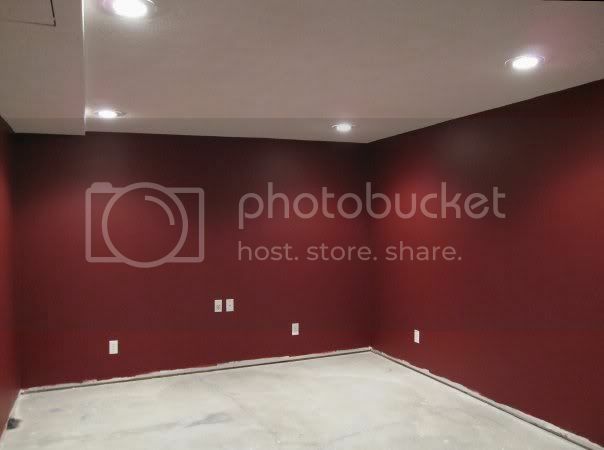 I actually didn't realize that you were completed with the room Brandon, thought you were still in the early stages and was going to throw in a suggestion or two but it looks like you have it covered and the room looks fantastic ... great job! 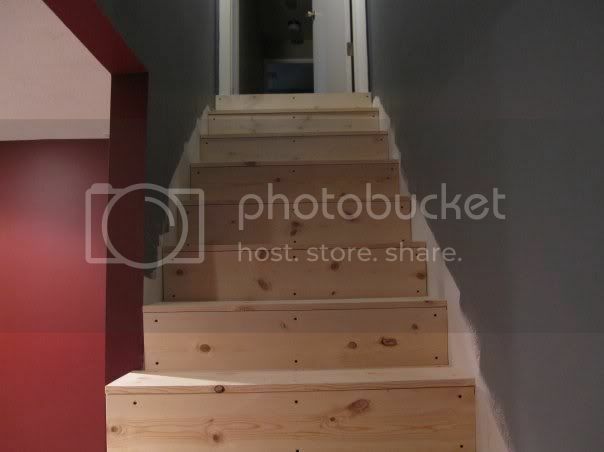 New boards have been installed on the stairs, will finish them soon. 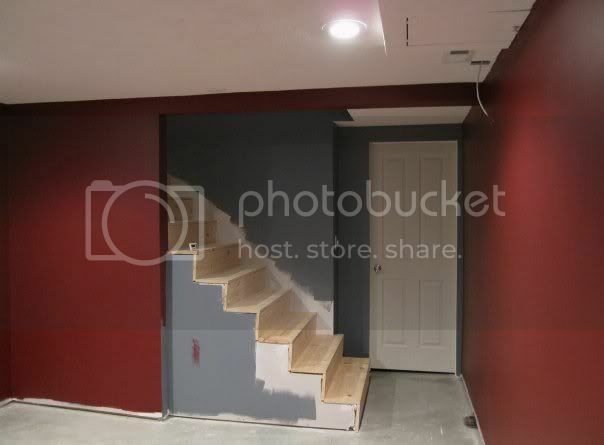 My wife and I liked the color of the primer in the stairwell and the way it contrasted with the red theater walls, so we had a top coat made that matched the primer grey. 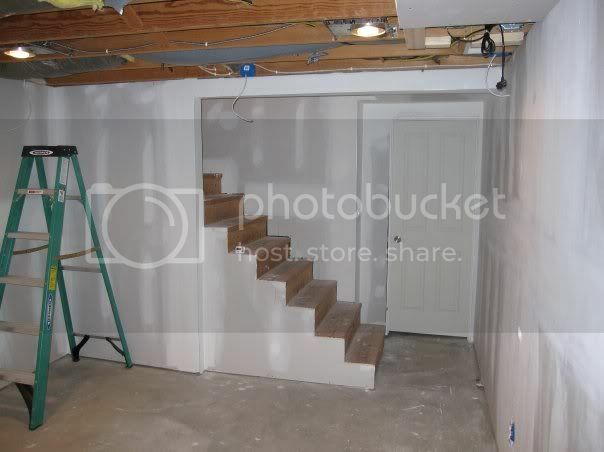 Another view of the new stairs. Carpet has been installed along with the baseboards. The TV was going to be delivered the following morning! 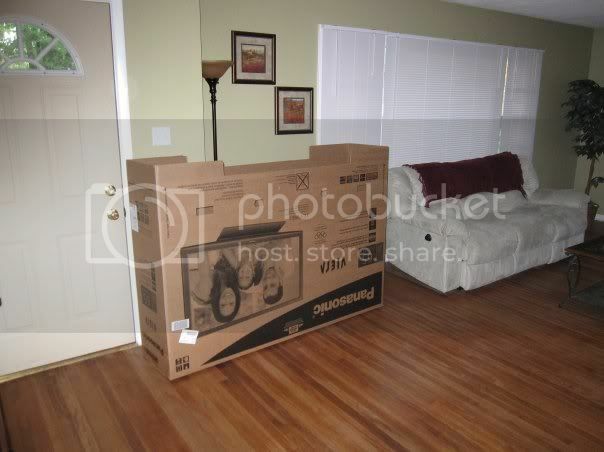 Here is the box the TV was packaged in...it was bigger than our couch! I spent the morning quickly putting the TV stand together so the delivery men would have a place to put the TV. The TV in its new home. Panasonic Viera 65" Plasma. 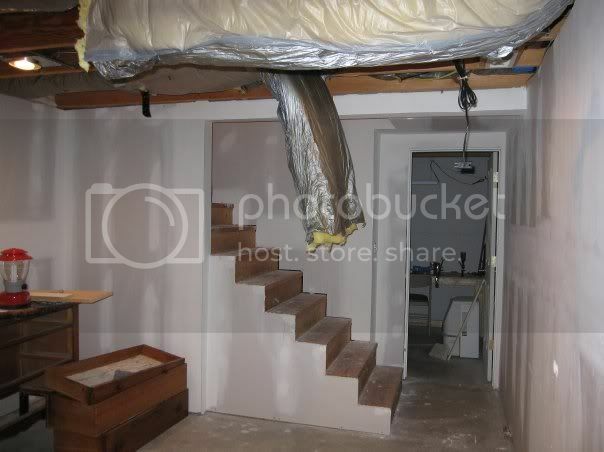 I feel sorry for the poor delivery guys who had to lug this 145lb monster down the stairs and around that tight corner! This is like time lapse photography - that or the elves have been extremely busy.